There is a real mixture of news for this edition so without further ado, here it is! 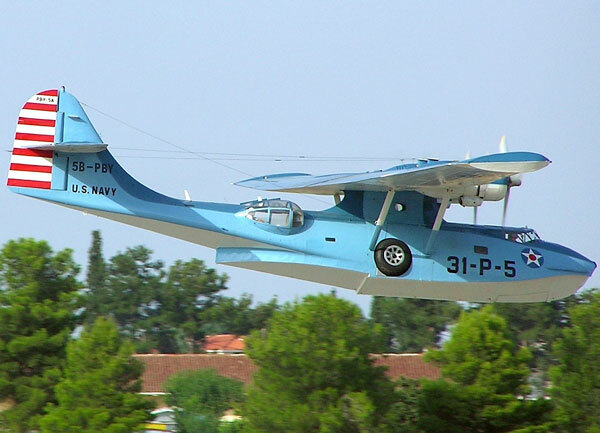 The most significant news in Europe is the departure from England of PBY-5A N423RS. Only flown three times since its arrival at Duxford in September 1998, the promise of appearances on the European airshow circuit were never close to a reality although it was repainted from its former Greenpeace colours to a rather scruffy Coastal Command scheme whilst still at Duxford. Its three flights were Duxford to Lee-on-the Solent; Lee’ to North Weald and North Weald to Biggin Hill and it spent extended periods of storage and maintenance at each of those bases with more than one ownership change along the way. Despite periods of extensive work by Mark Edwards of Airventure Ltd, the last owner decided to have it dismantled and shipped to the USA. It left Biggin Hill by road on January 19th this year and was loaded aboard or roll-on/roll-off freighter which sailed for Jacksonville, Florida via Le Havre on the 25th. Upon arrival in the ’States , it was transported by road to St Lucie County Airport, Fort Pierce, also in Florida, where restoration work will continue. Its owner is PBY Aviation although as at the end of March the FAA register still listed the owner as Wells Fargo Bank Northwest NA Trustee of Salt Lake City, Utah. Commenting on the dismantling job, Mark Edwards commented: “The job was interesting. We were contacted by the owners last year about the project and how to finally get her moved to the US. We started work in mid-November. The centre section had probably never been off since it was built and special frames had to be constructed for the hull and centre section. Outer wing panels and other large components where crated. There where four containers full of other components loaded too and they went ahead of the airframe. Two more containers of spare parts went too. As you know it was always USA bound from 7 years ago…its just taken a while!”. This leaves the UK with a Catalina population of just two – the Royal Danish Air Force PBY-6A L-866 in the RAF Museum at RAF Cosford and our own G-PBYA at Duxford. A few years ago we had five! Elsewhere in Europe, the Dutch PBY-5A PH-PBY, the oldest flyable Catalina in the world, is being prepared for another season of flying whilst Canso A N9767 based near Paris with the organisation France’s Flying Warbirds has been repainted with RCAF roundels and the hull code ‘S’ but does not seem to be very active, if at all. It does not appear on any of the FFW’s show bookings on its website as yet although that could change. In Canada, the owners of Canso A C-FUAW, Pacific Flying Boats Ltd, continue to work on her at its Victoria, British Columbia base and along with the Catalina Preservation Society have great plans for a Catalina/Canso Fly-in during 2017 although that will be a long and expensive flight for many potential visitors! News on ‘AW is that the re-paint in RCAF colours is almost complete and decals should have been added by now. It will fly as RCAF Canso A 11024/K, its original RCAF identity. The engines have been overhauled in Idaho (same engine shop as our own engine I would guess – Ed.). The airframe has been moved across Victoria airport to the Victoria Air Maintenance facility and a set of blisters are being worked on for eventual installation on the rear hull. In our last edition, I said that C-FUAW was the only airworthy Catalina in Canada these days. I’d meant to say Western Canada as the Canadian Warplane Heritage has Canso A C-FPQL (painted as ’9754’) at Hamilton, Ontario although to be fair it has not flown for a while now. Still in Canada, one of our longest-standing members Peter Marson the eastern side visited recently and reported on a number of Catalina/Canso airframes see. He confirmed that the previously mentioned C-FPQL/’9754’ Mary K is hangared at Hamilton and potentially airworthy whilst also a Hamilton is the hull of Canso A 9825 acquired from elsewhere in Ontario a few years back and currently still stored outside in the open; Canso A 11087 is still at its long-term home at the Canada Aviation and Space Museum at Rockcliffe, Ontario but is so hemmed in as to make it virtually impossible to photograph whilst, finally, another Canso A, C-FPQK, remains stored in the open at St Hubert in increasingly poor condition whilst its host museum, la Fondation Aérovision Québec, shows no sign of opening any time soon. Over the border in the USA there are several developments to report. The world’s last active Catalina water bomber, Wright Cyclone-powered ‘Super Cat’ PBY-6A N85U, was retired from fire fighting a while back and has recently been undergoing maintenance including an engine change at Arlington, WA. It flew again a few weeks ago and is reported as moving to, Pierce County Airport – Thun Field near Tacoma, also in Washington State. Apparently it is to be re-painted there in US Navy colours for use in the forthcoming film Indianapolis. Another ‘Super Cat’, PBY-5A N287, has been inactive for a while and up for sale. It now has a new owner – Cavanaugh Flight Museum at Addison, Houston, TX – and has been registered to Cavanaugh Air LLC but is believed to still be located in Florida awaiting delivery. The Cavanaugh Flight Museum is a great organization and has many aircraft on display including a number that give passenger rides so it will be interesting to see what happens with the PBY in due course. The US FAA continues to ‘tidy up’ its civil aircraft register and a number of old Catalina registrations have been removed recently as ‘expired’. The latest were all Catalinas flown by the Força Aérea Brasileira (FAB) and acquired by US owners when they were finally retired in the 1980s and later flown to the USA. All of them still exist as either static exhibits or restoration projects. The aircraft involved are PBY-5A N4582T (now under restoration at Floyd Bennett Field, NY) which was cancelled on December 3rd 2014 after expiring on June 30th, 2013; PBY-5A N4582U (on display at the Kirtland AFB museum in Albuquerque, NM) with same dates as per N4582T and PBY-5A N4583B (at the USAF Museum, Dayton, OH) with same expiry as above but cancelled on December 2nd, 2014. Two more ex-FAB Catalinas should be mentioned – PBY-5A N4583A (on open air display at NAS Jacksonville, FL) has not yet been cancelled but its registration also expired on June 30th, 2013 so presumably the FAA will get to it soon! The fifth aircraft is former RCAF Canso A N4934H (at the Historic Aviation Memorial Museum, Tyler, TX) which was cancelled back on June 7th, 2013. PBY-6A N7057C was acquired by the American Airpower Museum, Farmingdale, NY from the National Warplane Museum, Elmira-Corning, NY some time ago as an airworthy aircraft but was subsequently grounded when it was found to have corrosion issues. The wing centre section is now with American Aero Services in New Smyrna Beach, Florida being worked on. During January, the PBY-5A Catalina N84857 Gigi owned by the PBY Memorial Foundation at Whidbey Island, WA was towed from its former site on the US Navy base to a new home adjacent to the ‘Foundation’s museum site in the town of Oak Harbor during the night of 24/25th January. This will mean that the PBY will be much more accessible to museum visitors in future. It is planned to have the wings put back in place by the times these words are read. In Greece, the former Canso A N315KM mentioned in our last edition has undergone structural changes to comply with Type Certificate TC-785. It appears on the US register as a PBY-5A and has recently received a new horn-balance rudder manufactured in Germany. A first flight is due soon. In Australia, the HARS PBY-6A VH-PBZ has been busy over the last few months appearuing at a number of events including the 2014 Rathmines Catalina Festival on Octoberv 25th although on this occasion it was fly-bys only with no water landings. Meanwhile, work continues on the Catalina Flying Memorial Ltd PBY-6A VH-CAT at Bankstown Airport with the port engine being removed recently to facilitate repairs to corrosion found in the wing internal structure. The Rathmines Catalina Memorial Park Association Inc project involving the PBY-5A N7238Z, formerly in Puerto Rico, continues to move forward. Known locally as Our Girl, the Cat’ is being restored to static configuration as a focal point for the proposed flying boat museum at Rathmines. Until recently, the hull was located at Toronto, just to the north of Rathmines, but over the night of 29th/30th May it was moved by road to join the wings at Kilaben Bay which is even closer to Rathmines. Across the water in New Zealand, work continues on Canso A ZK-PBY to bring it back to airworthy condition after it was grounded by corrosion in the wing area a while back. Current plans will see it make its first display appearance at the 2016 Wings Over Wanaka airshow. The work to cure the original problem perhaps inevitably showed up other issues that needed to be rectified and this accounts for the delay in getting ‘PBY’ back in the air bit the team are positive that they are entering the home straight.